There is an old saying that the state of a person’s shoes is a good indication of what’s going on in their wallet. What that really means is that, right or wrong, people will judge you on your appearance. The same can be said for your car; if you roll up in anything less than immaculate, even your closest mates will be judging that shine — or lack thereof. Getting and maintaining a killer shine is not just the realm of the professional groomer — we wanted to give it a go and see exactly what we could achieve using Meguiar’s home car range. We didn’t pussyfoot around with a test mule, either. We selected the most notoriously difficult colour of all — gloss black — on a car that just happened to be an ex-cover car from four years ago. achieve the same results on your own car. Meguiar’s Dual Action Power System, Meguiar’s Wash & Wax, Meguiar’s Lambswool Wash Mitt, Meguiar’s Grit Guard, Meguiar’s Water Magnet, Meguiar’s Quik Clay Detailing System, Meguiar’s Ultimate Compound, Meguiar’s Ultimate Polish, Meguiar’s Ultimate Liquid Wax, Meguiar’s Quik Interior Detailer, Meguiar’s Perfect Clarity Glass Cleaner, Meguiar’s Hot Rims Aluminum Wheel Cleaner, Meguiar’s NXT All Metal Polysh, Meguiar’s Hot Shine Reflect and Meguiar’s pads and Supreme Shine Microfiber cloths. You need a clean car before you can carry on to Step Two. It is important that all loose dirt is removed to prevent scratching the paint surface. This will also ensure that you don’t damage or contaminate any polishing pads or microfibre cloths. 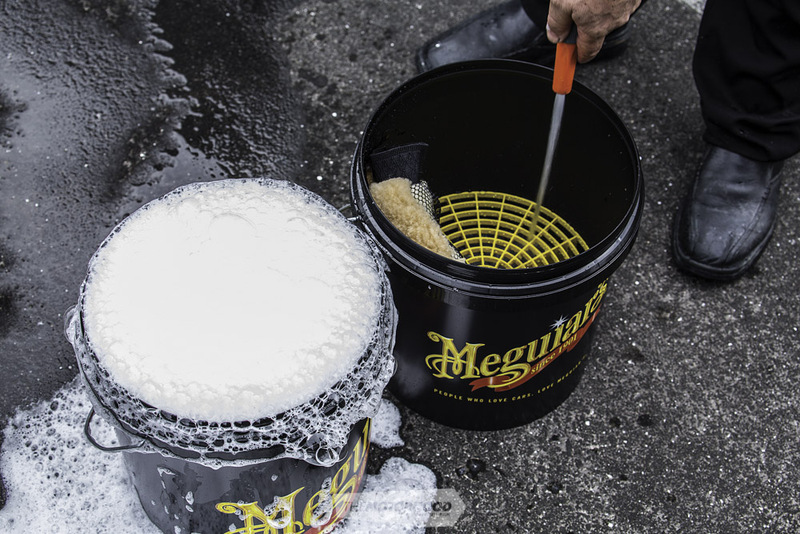 A two-bucket process is preferable; one with the Meguiar’s Wash & Wax and water solution, and a second with only water. This second bucket is for rinsing your cleaning mitt as you go. The Wash & Wax formulation is safe to use on windows without causing streaking, and helps to boost your car’s wax finish in between regular waxing. Once the car is all clean, grab your Meguiar’s Water Magnet and dry. Compressed air is great for pushing water from all the spots you can’t reach. Remove the clay from the packaging and flatten it out with your hand. The clay bar removes baked-on contaminants such as tree sap, overspray, and industrial fallout. A lubricant of some sort is needed with the clay, so included in the Meguiar’s Quik Clay Detailing System is a bottle of Quik Detailer. It provides great lubrication, and also smells amazing. Spray the surface, then rub the clay bar over the paintwork in a circular motion. Work only about a half a metre at a time. Once you have finished with an area, wipe it down with a microfibre cloth and run your hand over it to check the results. If it’s still a bit rough, apply the lubricant and go over it again. Don’t forget to work the clay in your hands to give you a fresh surface, and if you drop it on the ground, do not use it until you have cut off and discarded the contaminated area. The next product is Meguiar’s Ultimate Compound. This product is great for removing the light scratches, swirls, hazing, water spots, and oxidation, all of which the R32 was covered in. It is clear-coat safe, so get stuck in with some elbow grease. To apply, you can choose from two different methods; either by hand, or by using the DA Power System coupled with a red buff pad, which attaches to your household drill. Opting for the DA Power System will achieve a far greater result with less effort. Apply the compound to the pad in small dabs and work the DA around in a circular motion, only covering a small area at a time, around half a metre squared, working it in until the product goes glossy and all but disappears. This isn’t a product that should be left on the paint, so grab your microfibre cloth and wipe off the excess dry polish. This is the final step before we can wax the paint for the ultimate glossy depth. The purpose of the polish is to eliminate fine swirls, perfecting the paint prior to waxing. For this we chose Meguiar’s Ultimate Polish. We now switch over to the polishing pad for this step, as it’s slightly less abrasive and more suited to this product. We use the same methods as in Step Three. Apply the product to the polishing pad in small dabs, press firmly against the paintwork, and start working the drill. The polish can’t be left on the paint once it has dried, so ensure that you wipe this off with a new microfibre cloth soon after application. Waxing a vehicle’s paintwork adds a layer of protection from exposure to harmful UV rays and road contaminants similar to those removed with the clay bar in Step Three. Meguiar’s Ultimate Wax is its most advanced wax product, with a synthetic base instead of carnauba. This product doesn’t dry white, which is particularly good for black cars where white residue can sometimes be left from waxing. We used our third and final pad for this step, the waxing pad, which is softer than the previous two and should only be used with a wax product. Apply as you would the first two compounds. Although, unlike the others, this actually needs to be left on for a couple of minutes to dry, so by the time you have waxed the entire vehicle, it will be ready for you to wipe off with a new microfibre cloth. After all that hard work rebuilding the depth in the gloss, we wanted to ensure that it would last as long as possible, so at this stage, adding an extra layer of protection is well worth the investment. New to the market is Meguiar’s Ultimate Fast Finish; an aerosol polymer wax that you simply spray onto a microfibre cloth, wipe it on the surface, and then wipe off with a dry cloth. It gives that wet look for up to a year, and gives great water beading. With the paint looking so good, everything around it then needed to come up to the same level, so a range of products were thrown at it. First, the Meguiar’s Perfect Clarity Glass Cleaner, which is a product the team here swear by on our race-car windows. It has a great dust repellent formula and is streak free. The second area that needed attention were the super-rare Work Amkreeds. This process began during the washing process, removing brake dust with Meguiar’s Hot Rims Aluminum Wheel Cleaner. A soft-bristle wheel brush takes care of the stubborn dust. The next step is Meguiar’s All Metal Polysh to restore the shine. This is applied using a foam applicator pad, and then wiped off with a microfibre. This product is designed for use on polished alloys, and also works great on chrome. The final touch on the wheels was a coating of Meguiar’s Hot Shine Reflect Tire Shine. If you like wet-look tyres, this is the ultimate product as it’s formulated, as the name suggests, to reflect light. All up, we spent a good four hours working through the steps, and the transformation was remarkable. The black became a new colour, with so much more depth than before, and thanks to the protective layers it should stay this way for some time. Everything we used is formulated for the DIY job and can be purchased from your local automotive retailer or online from the likes of myautomotive.co.nz.